Slipped Capital Femoral Epiphysis (SCFE) is a relatively common disorder of the adolescent hip affecting as many as 10 per 100,000 in some regions of the United States. The incidence is increasing with a two and a half times increase over a two decades period presumably following the current obesity epidemic observed in western countries. The slip occurs through the hypertrophic zone of the physis with the metaphysis sliding / displacing anterosuperior while the epiphysis remains held in place within the acetabulum; thus, producing a retroverted proximal femur. [3,4] The true etiology of SCFEs is not well understood but many epidemiological risk factors have been well delineated. The average age at presentation for girls is 12 years old and for boys is 13.5 years old with boys being affected more often [58.8%]. The age at presentation is lower in those with a concurrent endocrinopathy: hypothyroidism, growth hormone deficiency, or hypogonadism being the most common. Almost 2/3 of those with a SCFE have a weight greater than or equal to the ninetieth percentile for their age. [2, 6] There is a strong racial frequency: Pacific Islanders [4.5], African Ancestry [2.2], Native Americans and Hispanics [1.1], Caucasians [1.0] Indonesian-Malay [0.5], and for Indo-Mediterranean peoples [0.1]. SCFEs are unilateral in 77.7% and bilateral in 22.3% with 82% of those with a subsequent contralateral slip occurring within 18 months of the initial slip. The risk of bilaterality can be as high as 100% in those with an endocrinopathy. Additional seasonal variations with increased rates of SCFEs observed in northern latitudes above 40 degrees (roughly New York City) in autumn and fall suggests a more complex pathology than simple increased sheer forces in obese children. Once identified percutaneous fixation of the SCFEs has been a well-accepted treatment for this disorder for over 20 years. [3,4,8,9,10,11,12] Other treatment methods including femoral neck and shaft osteotomies, open bone peg epiphysiodesis, spica casting and surgical dislocation with reduction and fixation all demonstrating varying degrees of good results. Single screw fixation of SCFEs using a 6.5 or 7.0mm cannulated screw is probably the most commonly utilized technique [13,14,15] with some surgeons preferring more robust fixation obtained with two tran-physel screws. Biomechanical testing has demonstrated that the second tran-physel screw increases the fixation stiffness by 33% at the risk of additional complications. 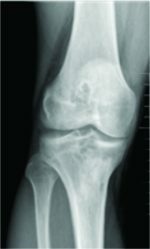 Complications associated with percutaneous screw fixation are not uncommon and consist of pin protrusion, chondrolysis, avascular necrosis, fracture, infection, slip progression and hardware fracture. [3,13,16,17,18 ] Management of hardware failures in SCFE patients is poorly outlined in the literature. The majority of the sources that report hardware failure as a complication of percutaneous SCFE pinning do not present how these cases were managed. Many simply state they did not cause a major issue with several leaving the proximal broken hardware in place. [15, 17, 19] The technique most commonly noted to address the fractured hardware was over drilling, a technique that sacrifices considerable healthy bone increasing the risk of avascular necrosis and or fracture. Consequently; we present a case where a single screw was utilized to fix an unstable SCFE that experienced hardware failure at approximately 3 weeks with recurrence of the slip displacement and how we addressed the complication. We report the case of a 13-year-old boy who fell down during a skiing trip. He developed left hip pain that prevented him from weight bearing on the affected limb . The patient was Caucasian, had a body mass index (BMI)<20 and no history of endocrinopathy. The patient was evaluated by an orthopaedic surgeon who diagnosed him with an acute unstable SCFE and took the patient to surgery for a percutaneous in-situ fixation. The procedure was uncomplicated with appropriate center-center positioning of the screw within the head and epiphysis [Fig 1a and b]. The patient returned home with his family at the conclusion of their vacation and followed up with a local orthopaedic surgeon (senior author). At 3 weeks he was ambulating without difficulty when he developed recurrent pain and inability to weight-bear. New X-rays were obtained that demonstrated failure of the hardware with progression of the SCFE displacement, with a Grade 3 slip angle measured at 60 degrees [Fig 1 c and d]. The patient was taken back to surgery for hardware removal and revision closed reduction and percutaneous pinning of the SCFE. Surgical dislocation of the hip with hardware removal, open reduction and pinning was the also listed on the consent if the closed procedure failed. Insitu pinning and remodeling was deemed unlikely to have a successful outcome due to less then 3 years remaining until the patient turned 16 and the patient already achieving nearly the same height as his father and skeletally mature older brother. The patient was brought to the operating room and placed on a fracture table in the supine position. Under fluoroscopic guidance minimal traction was applied to the left leg through the boot harness and the leg was internally rotated so that on both AP and lateral images the long axis of the screw shaft and the distal screw fragment within the epiphysis were co-axial. A guide wire was then threaded back through the screw allowing the cannulated screw driver to be easily seated within the screw head and the proximal screw fragment was removed. A cannulated Conical Extraction Screw (Synthes (r) Screw Extraction Set) commonly referred to as an “Easy Out” device (Fig 3) was then inserted over the guide-wire into the fractured distal screw fragment within the epiphysis through tract left after the removal of the proximal screw fragment. The sharp reversed threads of the of the Conical Extraction Screw / Easy Out allows this device to gain purchase in the fractured screw fragment and then back the screw fragment out. Once the screw fragment was removed from the epiphysis three trans physeal 7.0mm screws were placed for improved fixation strength of the SCFE. At 2 weeks post-op the patient had all restrictions lifted and returned to normal activities without pain. Follow-up at 9 months demonstrated a fused physis and no signs of avascular necrosis of the femoral head. With obesity epidemic in westernized countries and the growing population of children participating in high impact activities the current increased rate of SCFEs should not be expected to plateau in the near future. [2, 6, 20] As a result; those orthopaedic surgeons who treat pediatric patients need to be well versed in the treatments of SCFEs as well as the management of the complications that can occur with each treatment. Developing a diverse set of approaches is invaluable to getting the best possible result for each patient. 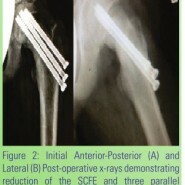 The case presented here reviews a technically challenging technique for the removal of retained fractured hardware from the epiphyseal fragment of a SCFE while maintaining as much native bone stock as possible. The original center-center position of the trans-physeal screw allowed for optimal purchase in the distal fragment but when the screw failed the optimal position for fixation had been violated, compromising repeat fixation in this area. Additional fixation was needed in the surrounding intact bone but the retained fractured hardware could potentially adversely affect the placement of the new hardware. So removal of the screw fragment was deemed necessary. If the screw had failed but the physis had fused or not displaced leaving the fragment in place could have been considered. The initial fixation in this case was ideal, with placement of a single percutaneous screw in the center-center position of the epiphysis. However; in this case the fixation was insufficient to control the sheer forces across the physis with loading during weight bearing. 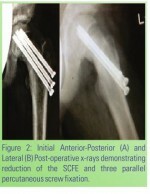 The literature supports the use of a single percutaneous screw vs multiple screws for the stabilization of SCFE’s, secondary to an increased risk of iatrogenic injury with the multiple screw approach. Removing a cannulated screw from a SCFE can have a complication rates greater than 50% in some reports . The difficulties seem to stem from the use of partially threaded screws which once threaded in the hip and left for a period of time have their thread tracts encroached upon by the surrounding bone, leaving the screw with no way to be backed out. [12, 19] With titanium screws the bio-compatibility allows for even greater osseous integration at the bone screw interface to the point where the torque/force imparted to the screw during attempted removal can result in screw breakage[12,19,15]. It is a presumed understanding of this potential complication and the desire to facilitate the removal of the hardware in the future that led the primary surgeon’s decision to utilize a fully threaded screw. Unfortunately; as a result the screw strength can be compromised. The bending strength of a rod is proportional to the radius to the 4th power so small reductions in the radius between a fully threaded screws core radius and a shank radius on a partially threaded screw can produce significant bending and sheer strength differences. The biomechanical studies have shown that there is a 33% increase in the construct strength when 2 screws are utilized but no additional proportional increase with 3 or more screws . However, Karol et al’s  study was performed in bovine femurs without any potential cavity defect within the epiphysis. It was our assertion that with the failure of the primary fixation and repeat slip the bone within the center of the epiphysis would have been compromised would no longer provide adequate fixation and multiple additional point of fixation would be needed around the periphery of the epiphysis. Consequently; 3 screws were utilized in a fashion similar to that commonly used for femoral neck fractures. Two points for further study would: 1) to try and define at what absolute body weight or BMI is an additional 33% fixation stiffness (2nd screw) needed to prevent cut-out or hardware failure and 2) what screw number and configuration is optimal in a simulated revision setting where the central area of the epiphysis has a cavitry lesion. Percutaneous management of SCFE screw breakage is possible utilizing specialized instruments and a precise and gentle manipulation preventing the need for more invasive treatments with their obligatory potential complications profile.